Nature's Best knows that all puppies and dogs learn at very different speeds, so we make sure to stock an extensive range of training products that will make you and your furry friend's training experience so much easier! From specifically formulated sprays and gels, to special training pads with flash dry technology and easy to use outhouses, your puppy or dog will be trained in no time at all. Simple Solution Training Pads are the perfect way to toilet train your puppy. These training pads are incredibly absorbent and hold ten times the fluid than standard pads. The centre is particularly absorbent to draw the liquid away from the bottom and prevent liquids from bleeding through the pad. The pad is constructed with six layers to ensure that your floor stays dry and free of stains. It is also designed to eliminate odour and have a powerful attractant to encourage pets to use the paid and reinforce natural instincts. 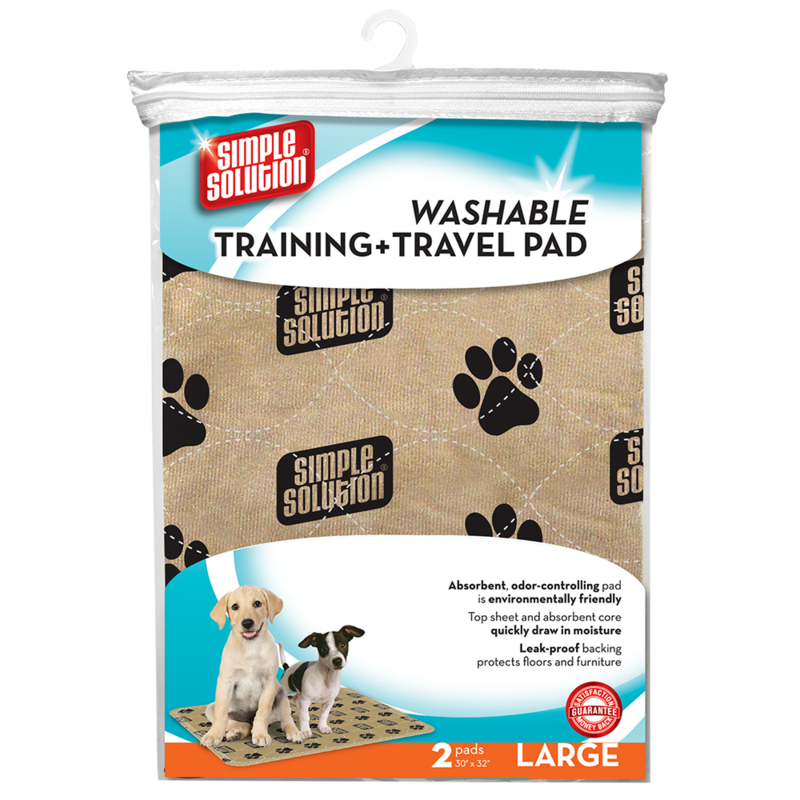 Simple Solution Washable Training & Travel Pad are absorbent, odour controlling and are environmentally friendly by reducing the use of throw away products and is guaranteed for 300 washes. Great for puppies when training, long travels and incontinent dogs. Other uses include crate and kennel liner, furniture and bedding protection, food and water bowl placement, post surgery underpad and litter box mat. Simple Solution Puppy Aid Training Spray (500ml) is scientifically formulated to encourage puppies to urinate in a specific area. Used on a daily basis it can help reduce the time it takes to house train your puppy. During the house training process, your puppy is bound to have accidents. So use in conjunction with Simple Solution Stain & Odour Removers. 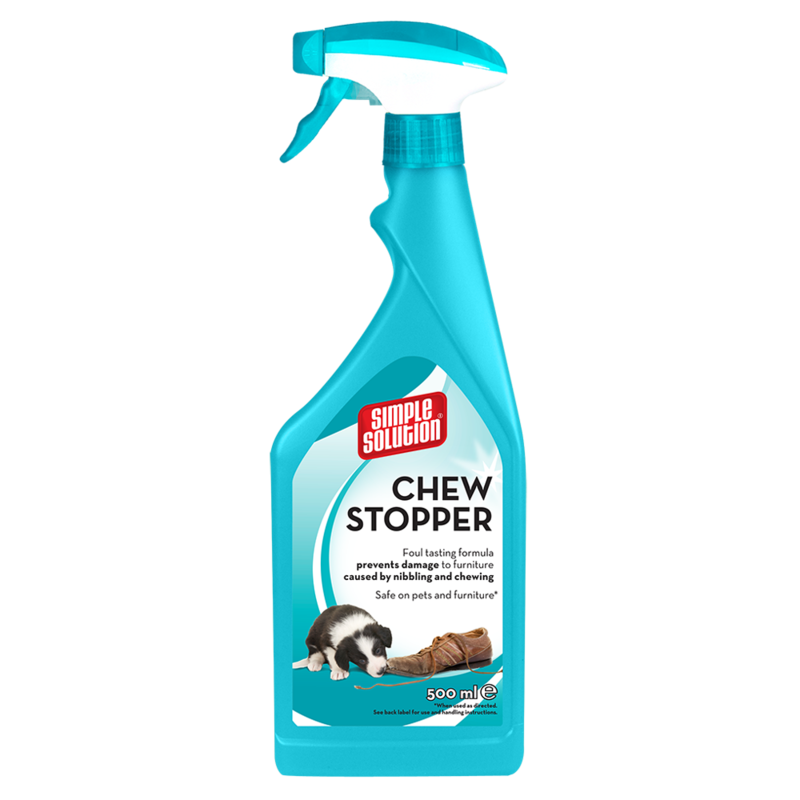 Simple Solution Chew Stopper contains a bitter tasting spray-on formula that when applied to an area such as furniture, wood or footwear it will discourage your pet nibbling and chewing due to the foul taste. Apply to any area where your pet may cause any unwanted damage and reapply regularly. This effective deterrent also discourages chewing and licking at skin, hot spots, bandages and stitches. 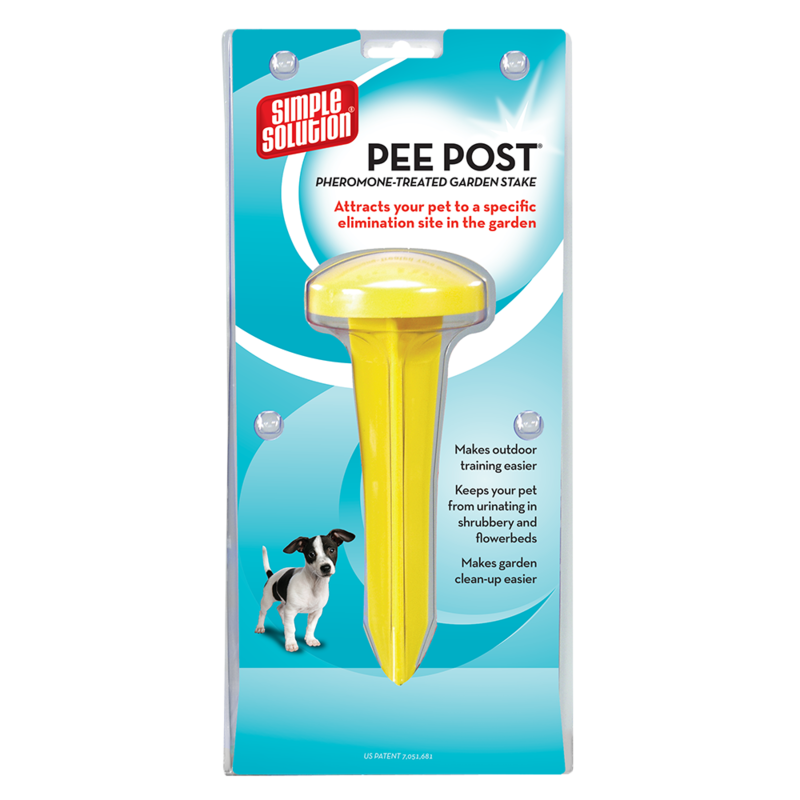 Simple Solution Pee Post encourages your pet to "go" in the right spot. The secret is in the pheromones. Dogs mark their territory by depositing pheromones when they urinate. Our pee post is infused with pheromones, which prompt your dog's natural instinct to urinate. Just follow the instructions, and keep to a dedicated daily routine of positive reinforcement. The CLIX Multi-Clicker is a volume controlled clicker for training your dog or puppy. The adjustable volume and tone control even enables dogs with sensitive hearing to be trained. The CLIX Whizzclick is a combination of the two most popular dog training items: a whistle and a clicker. This combined training tool is ideal for improving recall and long distance training. The CLIX Silent Whistle is a great tool for training your dog inside or outside. The Silent Whistle is also ideal for noise-sensitive dogs such as Border Collies. PLEASE NOTE: This whistle is only just audible to the human ear to help gauge its efficiency. The CLIX Two Tone Whistle is a durable and multi-functional dog training tool that offers two different tones. This makes it ideal for either training two dogs at once, or providing multiple commands to one dog. The CLIX Toilet Training Bells are perfect for your dog to "ring" the bell, rather than scratch around the door, when they want to go to toilet. Adjustable in length, making it easy to accommodate different sizes of dogs and doors. Also comes with a comprehensive toilet training guide. Great for safe dog socialisation. Allows dog to have a sense of freedom while still being controlled. The CLIX Recall Lines are ideal for recall training and allows your dog to seemingly have freedom, while still being under control. Great for social situations or for young learning dogs. The recall lines have a soft padded webbing making it comfortable to hold. Available in 5m, 10m, and lightweight 5m lengths (suitable for puppies and small dogs). The CLIX Training Dumbbell is the perfect tool for teaching your dog how to fetch and play. This retrieval toy is also capable of floating on water. The CLIX Training Dummy is designed for retrieval training with your dog. It is highly visible and also floats on water. Help to reward your dog or puppy for good behaviour while training with the CLIX Pro Treat Bag. It easily attaches to your side (or through a belt loop) with either velcro or clip, and is a great way to carry treats when out and about with your furry friend. The CLIX Target Stick is a key training accessory for clicker training. There is a soft, rubber ball on the end of the wand, which provides a visual target to easily guide your dog. The Playmate Dog Outhouse is the ideal toilet solution for indoor dogs who don't have access to the backyard while no one is home, or for dogs with no grass access all together. It will also assist in toilet training your adorable pooch. The Outhouse 'easy clean' tray system utilises three trays to make cleaning easier on you. The first layer is a porous synthetic grass mat, which lets liquid pass through to be collected in the bottom tray: ready for easy clean-up and disposal. The last tray is raised, allowing the top mat to stay nice and dry. ​Available in a 14pk, 30pk or 50pk. Hartz Home Protection Training Pads (Lavender Scented) won't spread or leak with flash dry technology that instantly turns urine into gel. Great for dogs who are left home alone, incontinent or senior dogs, toilet training puppies, and for protecting car seats. Can also be used for drying wet paws. Great lavender scent to help disguise smell! Available in 14pk, 50pk and 100pk. Also available at XL size in 30pk. Hartz Training Academy Pads are perfect for learning puppies. The pads feature built in attractant to help the puppies come back to the same spot. Absorbs liquid quickly and won't leak.